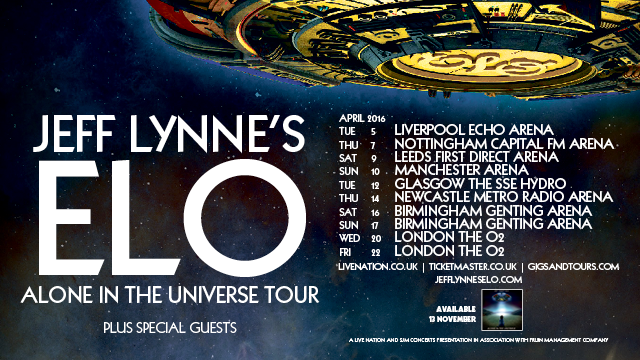 « JEFF LYNNE’S ELO UK TOUR 2016 – REGISTER NOW! It’s all go with ELO at the moment! The new album is out this Friday, the same day as the UK dates go on pre-sale. A decent run of arena dates here, although only one in Scotland and no Welsh date. The live line-up is set to include long time ELO member Richard Tandy along with Gary Barlow’s backing band again, although this has yet to be confirmed. This entry was posted on November 9, 2015 at 1:12 pm and is filed under ELO, Jeff Lynne, Melodic rock, Music for 2015 with tags classic rock, ELO, gigs, jef, melodic rock, Music for 2015, tours. You can follow any responses to this entry through the RSS 2.0 feed. You can leave a response, or trackback from your own site.